The crisis in Ukraine winds down in the wake of Poroshenko’s chocolate-covered win. The scary fascists who, according to Russia, have taken over Ukraine since the “coup d’état” and ousted the former president didn’t do too well. Who did do well were the actual scary fascists in Western Europe who were supported by, well, Russia. 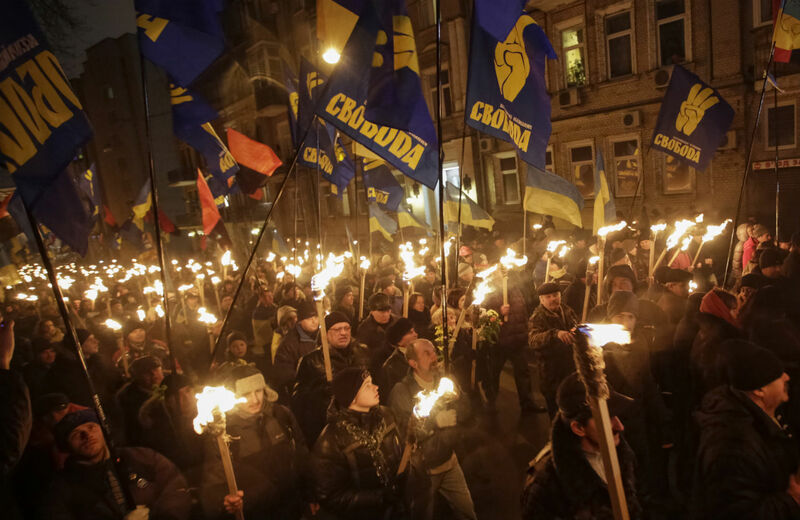 The supposed reservoirs of reactionary thinking in Western Ukraine generated an embarrassing 1 percent of the vote for Oleh Tyagnibok of ultra-nationalist Svoboda Party and less than 1 percent for Dmitry Yarosh of the new Right Sector party that sprung up during the protests. A story run by the Jewish Telegraphic Agency notes that Tyagnibok and Yarosh together received fewer votes than Vadim Rabinovich, a Jewish candidate who captured a little over 2 percent of the ballots. Meanwhile, the elections for the European Parliament—admittedly, a weak institution—reflect a troubling shift toward right-wing, fascist-leaning and ultra-nationalist politics in several European countries, including France and Great Britain. While some left-leaning parties did well, too, the biggest gains were made by parties such as the UK Independence Party, France’s National Front and a pair of far-right Greek parties. As I wrote in this space on May 21, Russia has formed an anti-EU alliance of convenience with many of these self-same fascist parties in Europe. Indeed, under Vladimir Putin Russia is gradually becoming a heartland-of-Asia power whose leaders encourage anti-Semitism, ultra-Orthodox religious nationalism, virulent anti-gay propaganda and more. Increasingly, a cadre of commanders with Russian citizenship like Mr. [Alexander] Borodai and a shadowy military commander named Igor Strelkov seem to be seizing control of the often rudderless rebellion as clashes with the Ukrainian Army intensify…. New questions had surfaced on Tuesday, when local officials revealed that a large share of rebels killed in intense fighting with the Ukrainian military on Monday were Russian citizens. On Thursday, commanders of the separatist forces said they planned to repatriate the bodies of 33 Russians from brigades that were organized in border cities on Russian territory and then traveled to Donetsk. Thirty-three coffins would be trucked to the border on Thursday, a member of the rebel force said. Yet even as the coffins were being prepared for transport, dozens of camouflaged rebels from the Vostok Battalion, which many of the Russians had joined, were breaking down doors in the rebel headquarters, where the leadership of the fledgling republic sat. It’s clear that when Russian leaders, such as foreign minister Sergei Lavrov, say that Ukraine is involved in a “civil war,” he means a civil war that is being deliberately stoked by Russia. Still, it’s good news that leaders of Russia and Ukraine may meet soon to talk about resolving the crisis, and talks are underway about resolving disputes over Russia’s supply of gas to Ukraine. And it appears that a significant number of Russian forces that had been massed on the Ukrainian border are being withdrawn, according to Secretary of Defense Chuck Hagel. Now that Russia has tentatively welcomed the election of Petro Poroshenko, the new Ukrainian leader has a tricky path ahead. Weakening and disarming the mobs that have taken over several cities in eastern Ukraine without inflaming the situation by heavy-handed tactics and overuse of force will not be easy. Meanwhile, President Obama, who’s maintained a hands-off attitude and rejected calls from US hawks and Ukrainian officials to supply arms to Kiev, needs to stand fast.